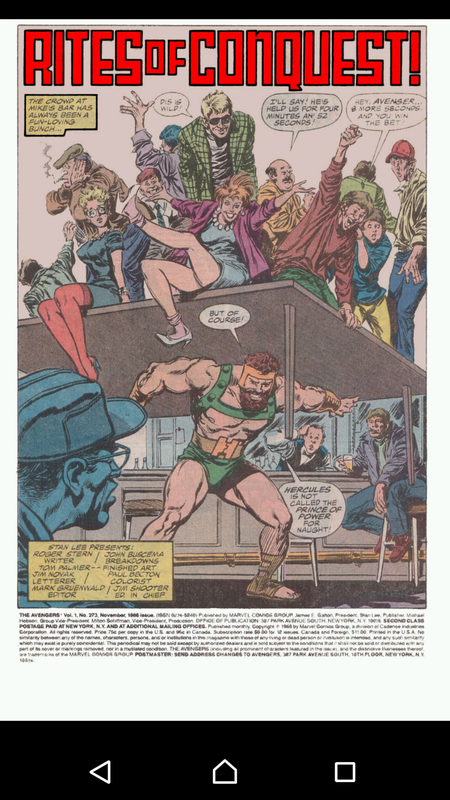 Synopsis: Rites of Conquest was written by Roger Stern with art by John Buscema on breakdowns and Tom Palmer on finishes and opens with Hercules holding up a solid oak table with a dozen people sitting on it, to settle a proposition bet with a guy he is drinking with. The pair drink on with Hercules espousing the virtues of his fellow Avengers; Captain America, Namor, Black Knight and Captain Marvel, but gets quite irate when the Wasp is mentioned, especially in her capacity as Chairperson. He starts getting violently angry and starts trashing the bar they are in, the damage even spilling out into the street. 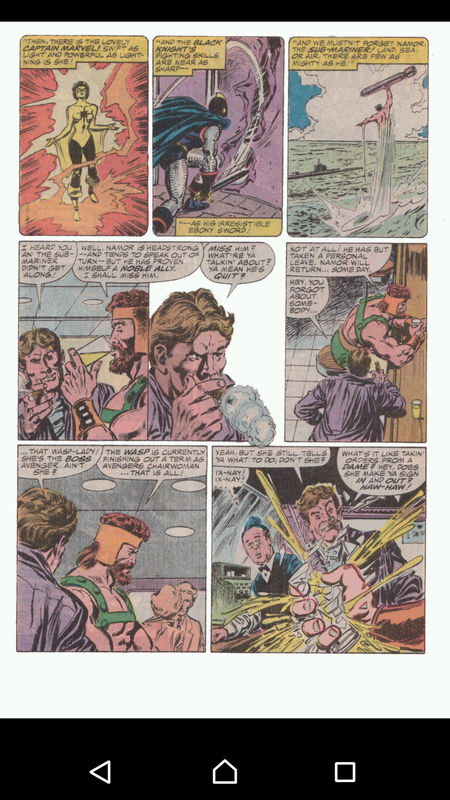 The other guy leaves as Hercules tries to make amends after calming down and it turns out that Hercules’ drinking buddy is the villain known as the Wrecker. Wrecker checks in with Rita ‘Yellowjacket’ DeMara, who then contacts Dr Karla ‘Moonstone’ Sofen who passes the information along to their leader Baron Helmut Zemo. Zemo is planning something and needs the villains he has collected to do it, even Moonstone, but it’s clear that he doesn’t trust her. Elsewhere Monica ‘Capt Marvel’ Rambeau visits the moon and paris, revelling in her powers. Zemo is aware of this, troubled by just how powerful Marvel is. This causes him to check on Moonstone over the progress on controlling the villain Blackout, whilst the Fixer works on Zemo’s headband/tiara thing. 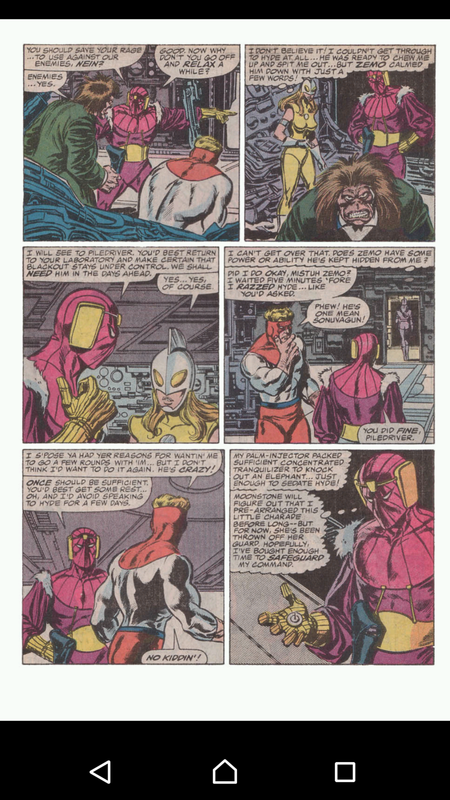 Whilst this is going on, Piledriver acts on Zemo’s orders to attack Mr Hyde and Zemo ends the battle in front of Moonstone to reassert his leadership in front of her. Somewhere else entirely, Janet ‘The Wasp’ Van Dyne is at a social event with the clearly smitten Dane ‘Black Knight’ Whitman. Whilst there they are accosted by journalists, but saved by the mercenary Paladin, causing friction between Dane and Janet, who is oblivious to Dane’s feelings. 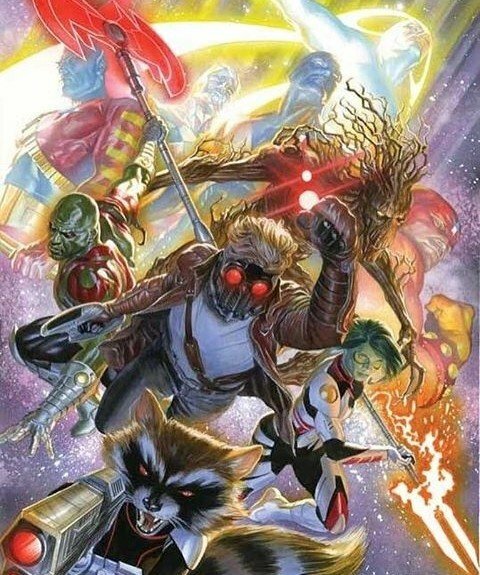 Zemo gathers his troups and outlines his goal, to seperate, weaken and utterly defeat the Avengers. 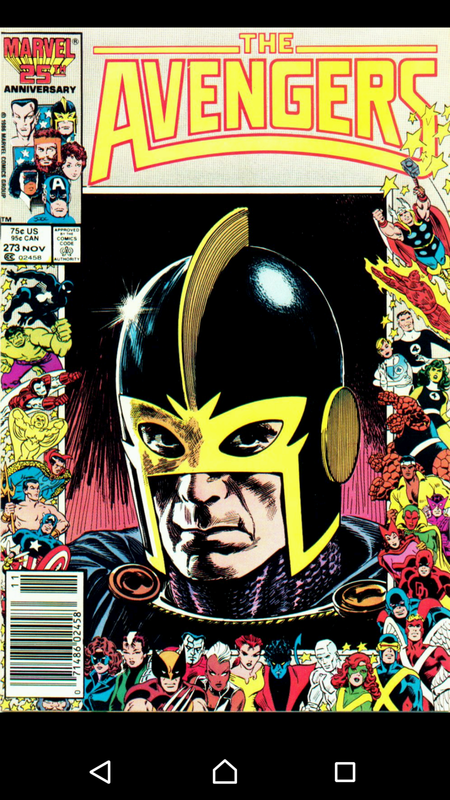 The group he has gathered, consisting of: Goliath II, Wrecker, Titania, Absorbing Man, Pile Driver, Bulldozer, Thunderball, Yellowjacket II, Tiger Shark, Fixer, Mr Hyde and Blackout are skeptical of success, spurred on by Moonstone, trying to undermine Zemo’s leadership, a tactic ruined by Zemo unleashing Blackout upon her. 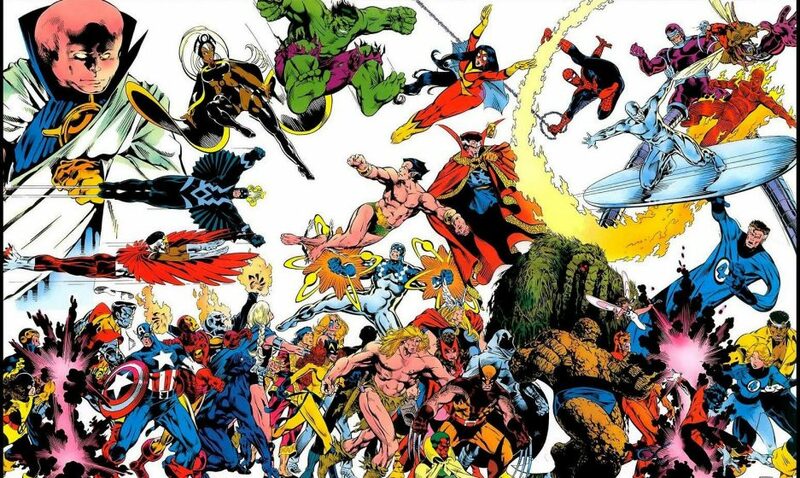 There is more back and forth, but the time for talking is over and with only Edwin Jarvis on monitor duty, these Masters of Evil know that now is the time to attack. 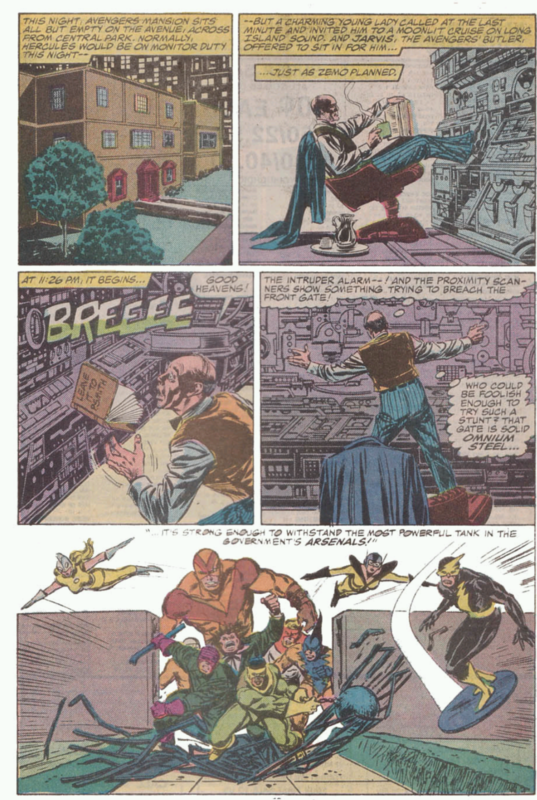 They invade the mansion and get past all the automated defenses and capture Jarvis. Avengers Mansion belongs to the Masters of Evil. 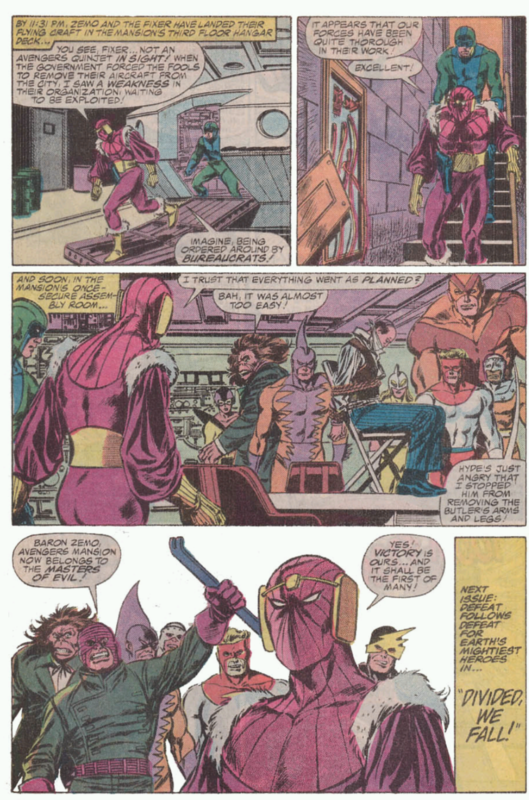 Notes: The comic is called Avengers 273, but this is Baron Zemo’s story and it’s his point of view we get more of here. I wouldn’t go as far as to say he is sympathetic or anything, he lies, threatens and plans murder, so he isn’t the hero, but you do get a sense of who he is. His hatred of the Avengers stems from his hatred of Captain America and he puts all of that hate into ending the Avengers completely. It’s an almost Game of Thrones like story, with you almost rooting for an absolute villain. Stern writes the hell out of this, leaving the Avengers in the background, but never once leaving them out. He builds the threat of the Masters bit by bit, so when you see them all together, you only feel that the Avengers are screwed. This was the beginning of the Under Siege story, that is one of the best remembered tales of this era and it deserves from this beginning all of the acclaim it gets. This goes from opening act, to act two real quick, but the reader isn’t left behind, only the Avengers are on the back foot here and it’s only going to get worse. The art is at best perfunctory, Buscema is not at his best and Palmer does tend to add a thick line to things, but he is a decent enough draftsman that the art works for what it needs to do, which is keep the story going along without overpowering the writer. This isn’t the best art pairing around, but that becomes the cloud inside the silver lining only and doesn’t take away from a great issue that I picked because the rest of the month looked less than spectacular, I’ll be honest, I got lucky with this one. Next Time: Iron Man gets caught up in a Dominic Fortune adventure, no me neither.